I am always watching what I eat. I try not to over-eat or eat poorly. Of course, I have days when I splurge, but most of the time I try to eat smaller portions, lots of vegetables and overall healthy meals. So in order to allow those splurge days, I often turn to Weight Watchers prepared meals to keep my diet under control. 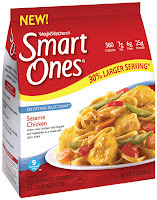 Recently, Weight Watchers has introduced Weight Watchers® Smart Ones® Satisfying Selections. These meals in a bag have 30 percent bigger portions than a traditional tray meal. Also, each meal has heartier pieces of meat and veggies. Most importantly, with all this extra food, the meals are less than 400 calories, has between 8-10 Weight Watchers PointsPlus and 25 grams or more of protein. Personally, I like the convenience of a prepackaged frozen meal. My biggest conflict with these meals has been the size. While these meals tend to be ideal for lunch, these options for dinner often left me wanting more food. This weekend I tried the Chicken with Broccoli and Cheese Weight Watchers Smart Ones Satisfying Selections for dinner. I was on my own for dinner and I wanted something quick and easy to fix. I was very impressed with the amount of food in a single meal. My meal filled the entire bowl. When I finished, I was full and definitely didn't want any more food. What I liked about the Chicken with Broccoli and Cheese meal is the amount of vegetables in the dish. The broccoli pieces were plentiful and flavorful. Also, the chicken was well seasoned. Even better, the pieces were large. I definitely didn't have to play "where's the chicken." 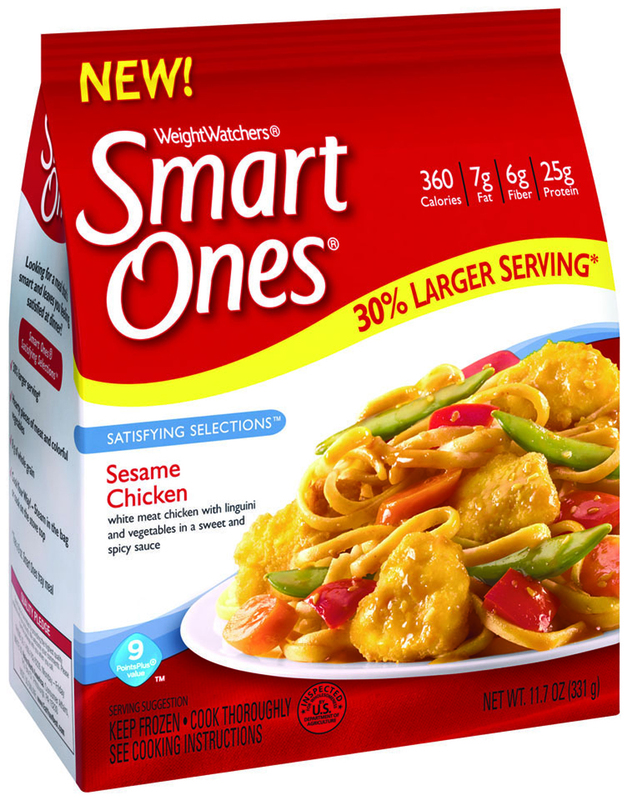 The Weight Watchers Smart Ones Satisfying Selections can be cooked in the microwave or on the stove top. There are five (5) flavors: Chicken with Broccoli and Cheese, Chicken & Broccoli Aflredo, Chicken Teriyaki Stir Fry, Sesame Chicken and Ziti with Meatballs and Cheese. The meals retail for around $3.50 a package. Right now, you can get a $1 off coupon to try these new meals from the Smart Ones website. For a store selling the Weight Watchers Smart Ones Satisfying Selections, please visit http://www.eatyourbest.com/storelocate.aspx. I'm stocking my freezer with lots of Weight Watchers Smart Ones for those busy weeknight dinners. Which one will you try? Disclosure: This post is part of a SocialMoms product evaluation, for which I’ve been selected. I’ve been compensated for my time with 6,000 My SocialMoms Rewards Points. The opinions expressed in this post are mine and don’t necessarily reflect the opinions of SocialMoms or Heinz. For my complete disclosure policy, please visit www.more4momsbuck.com/disclosure.